« It’s a Whole New World Times Two! Up at 3am for the third day in a row for both Denise and me. Photography with the 1st Palouse IPT group till 9:30. Photoshop, lunch, nap, plan for the next two days of the IPT, afternoon session, work, and then sleep. This blog post, the 142nd in a row, took about an hour to prepare. It was published just after midnight on Saturday. 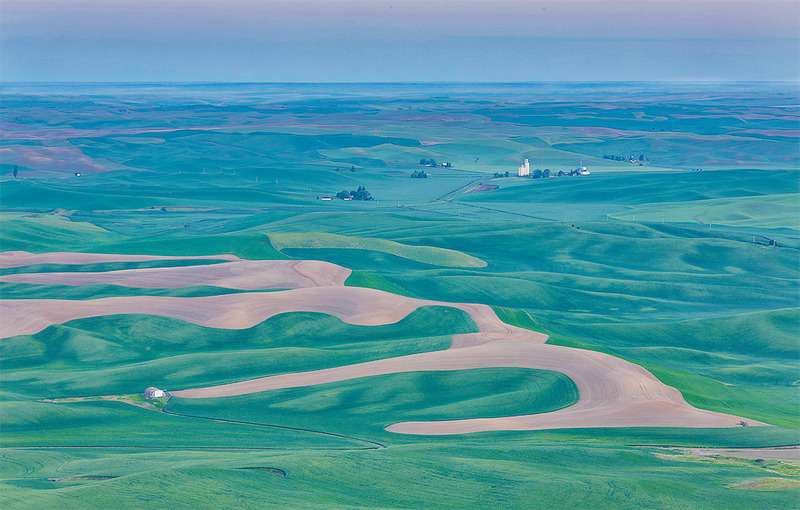 This 3-frame in-camera HDR Art Vivid image was created from atop Steptoe Butte on the 1st Palouse IPT with the Canon EF 70-200mm f/2.8L IS II USM lens and the Canon EOS 5D Mark III . ISO 400. Evaluative metering +2/3 stop (+/- 2 stops) around a base exposure of 4/10 sec. at f/16. AWB. Live View with 2-second timer. Center AF Point (Manual selection)/AI Servo/Rear Focus AF 1/3 of the way into the frame and re-compose. Click here to see the latest version of the Rear Focus Tutorial. Click on the image to see a larger version. I was so pleased with the image design here that I would not change a single pixel. When I first saw and tried to photograph the swirly patterns of the dirt fields I hated the white Quonset hut; when I framed tight, it wound up right in the middle of the image and ruined the composition. When I went from the 200-400 to the 70-200 to go wider, everything began to fit in the frame (as denise had suggested it would). The curved road leading to the hut added to the image design, and the hut balanced beautifully with the large white structure in the upper right. We originally thought that it was a church but closer inspection showed that it was a grain elevator. I made sure to give the small tree on the upper left a nice border. It was equally important that I give the rightmost tip of the nearest dirt triangle in the lower right corner a nice border. The distant rolling hills draw the viewers eye through the frame toward the horizon. Thanks for posting all these great images on your blog, and teaching me to improve my photography. Appreciate all your hard work. A question about the in-camera HDR (Child’s Farm field) taken with 5D. I tried an in-camera HDR on my 7DII, and noticed that the HDR image is slightly cropped. Does that happen with 5D, and have you tried in-camera HDR on 7DII yet? I like the way the white hut and trees move the viewers eyes from bottom left to top right, and the pastel colors are beautiful. Artie, why ISO 400 rather than 100?? I guess I always thought, if the situation allowed it, that 100 was better than 400. Less noise, bigger prints. No? No big prints here. There are some who say that ISO 200 is better than ISO 100…. Wow Artie! You have outdone yourself again. I love the result you created. It is creations like this and the red and yellow blur off the coast of California that really show the range of your expertise. You continuously make us say, Wow! You indicate the image was taken with the 7D2, but I thought that was left home. Usually you use the 5D 3 for in camera HDR. Did you bring the 7D at the last minute? Interesting effect as an HDR image. I have a shot where the grain elevator is in the lower left, I call it the castle!